Join us noon Saturday, August 8th at FATE Brewing Company for our 2nd Annual brewed-for-good collaboration release party. Here’s the story. Each year firefighters nationwide raise money for MDA, the Muscular Dystrophy Association, with their Fill The Boot campaign. For the second year in a row we teamed up with our local fire department, Local 900, to participate. 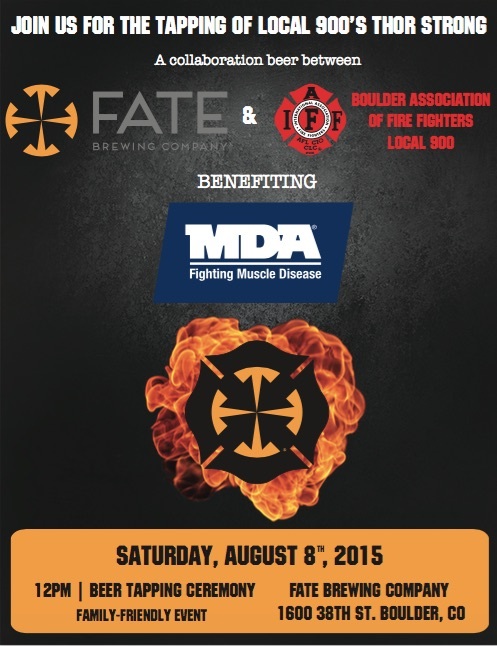 On July 7, our Head Brewer Jeff Griffith alongside a team from Boulder Fire Department Local 900 brewed Thor Strong. The best part? $2 from each pint of Thor Strong sold will go to MDA. Saturday, August 8 Local 900 will be here accepting additional Fill the Boot donations and selling Second Annual collaboration brew t-shirts. Plus, to up the ante, we will be donating 5% of all event proceeds to MDA. Now we just hope to see you here too. Please join us in celebrating beer brewed for good by drinking for good.